My last several long runs have been "Drop-off runs despite the fact that I have an angel in residence who will crew me if I ask. One of her ideas of quality time is to chase me out the door before dawn, drive ahead two miles, and wait for me to trudge into view before handing me a water bottle and a smile that says, "You're doing great." So why, if I have crew, would I choose not to utilize it? The easy answer is that I'm mental. The purpose of the long run is to create the physiological changes that allow for greater energy utilization. The body adapts by increasing the capillarization for blood flow allowing more nutrients - food, oxygen - to reach the working muscles. It also increases the number of mitochondria in slow twitch muscle fibers to aid in generating energy from the food and oxygen. That happens if I have crew or not. What changes is the option, every two miles to jump into a warm car, and think "That's enough for today." Once I get dropped off, I'm on my own. I carry a little cash for emergencies but no phone. Also, I always get myself dropped off a little past my last long run distance. I've done enough of them that I know that my last long run is an excellent predictor of my endurance training distance. Generally, I plan on two miles farther each time until I reach my desired distance. The two mile mark is important. That's when my brain starts to tell the body to shut down, we're gone too far. 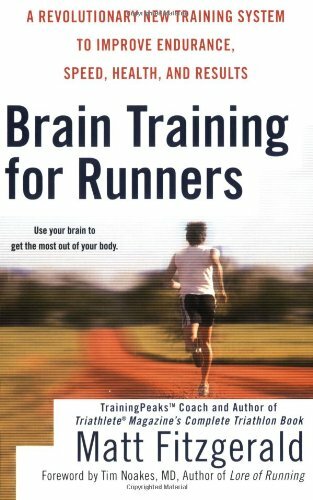 Matt Fitzgerald brings this up in his book Brain Training for Runners. (Great book, btw.) The brain, sensing that we've extend past our comfort zone, acts to "protect" us from damage by sharply curtailing the chemical signals that keep us happy while we're running. It part of our subjective feedback loop. So, my current goal with the long runs isn't building the body. It's building the mind, conditioning the brain and my will to continue past the barriers that appear to be in front of me. My last two runs, I broke down two miles before the end. Both times, I managed to restart after breaking, forcing past the "I'm done" phase. Those first few strides were crap, sloppy and awkward, but they smoothed out. The brain will learn, more can be done. Next week, I'll add another mile or two and go through the feel really good phase, the "this is work" phase, the "I'm done" phase, to the break-through phase. As I rebuild my body, I'm rebuilding my brain and my will. Halfway around a 30 mile trail loop in the middle of nowhere, I'll need them to believe.